Emilie Shapiro's rainbow moonstone pendant evokes a moonlit sky. Daytime is for the ordinary activities of life, the ones you have to do. But nighttime is what you make it, and when the sun sets, the shimmering moon presides. 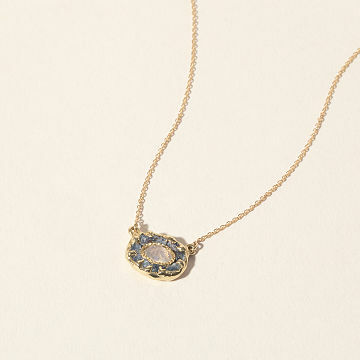 Emilie Shapiro's rainbow moonstone pendant evokes this lunar mood. The vintage-inspired, 24-facet rose cut enhances the natural inner glow of the stone. Resembling a midnight sky surrounding a full moon, a halo of sapphires is cast in place with an ancient Egyptian technique that embeds them in molten, 14-karat recycled gold. Handmade in New York. This is a made-to-order item. If you order today your item will ship no later than 5/30/2019. This is a very pretty pendant. It was a gift and I like it very much, but I will be looking to replace the chain of the necklace as it looks cheap compared to the pendant. Not the best value as it is quite expensive to need a new chain. But the pendant itself is unique and versatile.